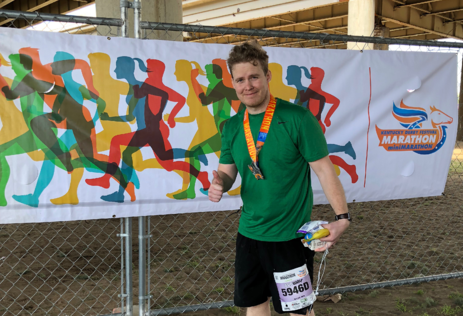 In April, I completed my first marathon. My boss tried to talk me out of it by warning me that without proper training I was going to be miserable for the entire 26 miles. Well, I showed him - I was only miserable for half of it. Olen after completing his first marathon. Thankfully, the weather was almost perfect for my little run (between 55 F and 65 F). And because of my experience in the Safety industry and time as an EMT, I knew how important my clothing choice and hydration were to my success. However, the run did give me cause for pause – as summer is approaching and many workers will be facing extreme heat. And I have always felt that we, as Safety Professionals, could do more to educate our people about these hazards. Which measurement should you use? For a number of years, relative humidity and air temperature have been used as an indicator of heat index and the “danger zone” – for good reason, it’s effective and simple. However, NIOSH recommends that both heat index and wet bulb globe temperature (WBGT) are used to measure environmental temperature. The wet bulb globe temperature is used to determine the Recommended Exposure Limits (RELs) for acclimatized workers and the Recommended Alert Limits (RALs) for un-acclimatized workers in hot environments. WBGT adjusts the temperature to represent the impact of humidity, wind, and radiant heat have on heat strain cooling effectiveness. 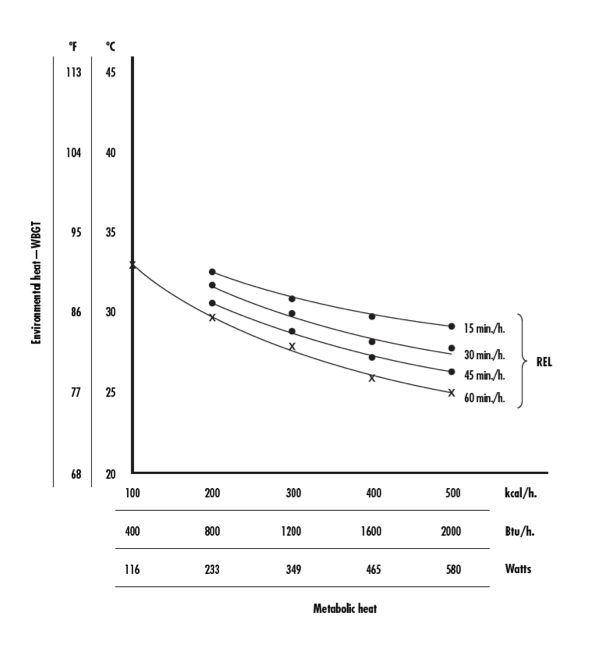 For indoor environments, the dry-bulb temperature (temperature without impact from other factors) is not used since the globe and the dry-bulb should be equal without radiant heat. The globe temperature is used as it will also detect non-solar radiant heat sources if they are present. The equation weighs the wet-bulb 70% and the globe 30% of the weighted average. Natural Wet-bulb Thermometer (nwb) or Wetted thermometers are used to measure sweat's effectiveness in cooling the body. It represents increased sweat evaporation potential when wind speed increases and decreased sweat evaporation potential when there is more moisture in the air. When working for extended periods of time or intervals, a WBGT average should be completed. OSHA recommends that the temperature is taken on an hourly basis, especially during heat waves. OSHA further recommends determining the metabolic work rate to determine if a heat hazard is present. Once these limits are reached, either through environmental factors or workload, controls are necessary to prevent heat-related illness. Controls include work/rest regimens, shade, and hydration. 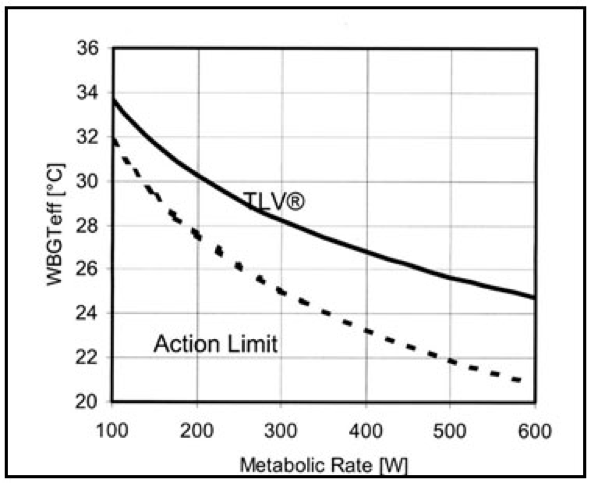 The TLV, provided by ACGIH, is the meeting point of the WBGT and Metabolic Work Rate. Alternatively, NIOSH provides the following recommendations for heat exposure limits and time per hour that an employee should be exposed. If your employees are working beyond the TLV or REL – you need to have a plan in place that provides them the opportunity to hydrate and get their core body temperature back to normal. Until next time, Stay Cool and Stay Safe. Contact an ORR safety expert today to learn more about heat stress and how we can help your workers keep cool this summer.